Today I’m sharing my weekly vintage attire blog, featuring all the glamorous clothing I wore last week, and a little on what I’ve been up. I love sharing my styling of clothing to hopefully bring a little sunshine your way and maybe give you a little inspiration too! Firstly I’d like to wish you all a very beautiful Valentine’s Day, love is all around us all the time but it’s lovely to take the time to appreciate the wonderful people who enrich our lives so much. Taking Monday off to relax my week started Tuesday with working from home followed by a meet up for The Perth Pinup Community, we had intended to attend a swing dancing class through Swing It, alas the class had so many people attend we didn’t make it in before they reached maximum occupancy. We then went to The Rosemount for dinner, which was with lovely company but sub par service with our food coming out incorrect and them not offering a refund or substitute. Even with some unpleasantness the night was still good thanks to the lovely company and conversations. Blouse: vintage nightwear from an op shop. Wednesday was another lovely day of training, working from home and recording a blog. I also had the pleasure of catching up with some fellow burlesquers for a costuming session where we worked on projects and ideas we had, a sense of community and support is so very important and I’m lucky to have such people in my life. Blouse: a find from my favourite op shop, Anglicare Morley. Thursday I visited my favourite salon, Cherrybomb Beauty Parlour! There’s nothing quite like being surrounded by beautiful souls and beautiful vintage decor. I had my brow treatment and nails done. In the spirit of love I had hearts of red with a pink background painted delicately upon each nail by the amazing technician Gosia! Cardigan and hair flower: from my favourite op shop, Anglicare Morley. Skirt: a gift from my mother-in-law, a skirt she had when she was younger. Saturday I had a marvellous day of vintage shopping, first stop was Big Al’s with The Vintage Collective Markets, where I pranced around getting my photos taken, browsed the markets and met some wonderful friends. I then visited Bluebird Vintage and La Vida Vegan Grocery before heading home. Jeans and belt: Cherri Lane. Sunday my husband and I celebrated Valentine’s Day, as the actual day being Tuesday meant it hard for us to celebrate as I have training in the evening. We drove around the Swan Valley before a decadent lunch at Swan Valley Cafe (an awesome vege/vegan cafe), op shopping and other fun. We also went on a car cruise later in the day as the weather in the morning did look rather rainy. All up though a great weekend. Dress: from my favourite op shop, Anglicare Morley. My sweetheart gave me a beautiful teacup Chip, from Beauty and the Beast and a lovely tiki cup set as Valentine’s gifts. Another amazing weeks has passed us, and we now have a new week to create work, and achieve whatever we put our minds too. Dream big and make it happen. February 11th: Big Al’s Poker. March 19th: Pinup Pamper Basic Workshop with Lany L’Amour & Gary Jackson Photography. March 24th: Boudoir Burlesque Show. March 26th: Miss Lady Lace’s Pinup Parade at The Vintage Collective Markets. 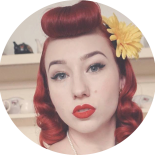 This entry was posted on February 14, 2017 by Miss Lady Lace in Pinup, Weekly Vintage Attire and tagged 1940's, 1950's, blogger, glamour, miss lady lace, miss lady laces pinup blog, perth burlesque, perth pinup, perth pinup blog, perth pinup community, pin up, pinup, pinup blog, pinup blogger, pinup fashion, pinup girl, pinup life, pinup lifestyle, pinup perth, red lips, retro blog, retro girl, retro glamour, the perth pinup community, victory rolls, vintage, vintage blog, vintage blogger, vintage fashion, vintage girl, vintage glamour, vintage perth, vintage pinup blog.